Bali 4.3 catamarans were designed to meet the needs of yachtsmen looking to sail with maximum living space, comfort and safety. For this the CATANA yard brought a particular skill to the design of revolutionary range of catamarans, with innovative ideas as yet unseen in this sector and which break with maritime tradition. With its vast, unhindered interior and exterior living spaces, an optimal level of self-sufficiency and a pioneering nature, the range of Bali Catamarans is offering new pleasures and sensations to yachtsmen turning their backs on tradition and who want to realise their dreams. 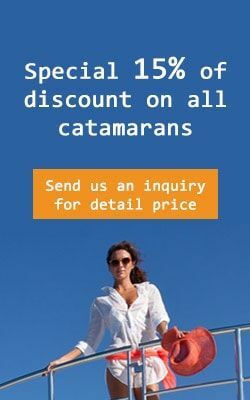 Charter catamaran Bali 4.3 for rent in Greece and let us catapult you away for an unforgettable charter journey along the Greece islands from Athens, Laviron, Lefkada but soon from all bases in Greece. Available for catamaran Crewed with our professional crew this all new sailing yacht can be rented for one way charters to and from Athens to Mykonos as well as other famous islands subject to availability. Send us an Inquiry right now to secure top prime dates avoiding disappointment later or availability risks.